My new book – Organic Marin, Recipes from Land to Table – punctuates a lengthy transition from newspaper journalist to photographer and (still) writer. The passage has been at times unsettling, exhilarating and frightening in ways I never foresaw. The journey continues. The photography challenges me technically, artistically and financially, but it represents what I set out do as a younger man and I remain compelled to pursue it. I write less, but what words I do put down are more honest. How this book came to be might, I think, interest anyone who finds himself at one of life’s many crossroads forced to choose a direction, perhaps one less familiar than the well-trod path that brought him there. As we age, the road ahead shortens and opportunities for change lessen. I am fortunate. Change has come to me often, though not often easily. This latest new direction, though, was the hardest. My job became my identity. I defined my worth through professional success. When one day it was gone, I drifted, uncertain how to value myself. Then, through the goodness of family and friends I found my way forward by reaching into my past. There, still aflame, was the passion of youth, waiting to be put to use. I had loved my job, but it was not the “good work” I wanted – and apparently needed. One of the most innovative thinkers about modern journalism, NYU professor and blogger Jay Rosen, did me the honor of praising the writing I had been doing on my former blog, First Draft, about how poorly newspapers were responding to the digital media revolution. The roots of First Draft were in part cathartic, exploring why I became a journalist and why I eventually left its institutions behind; they were also conditional – in my early 50s I was out of work after the bust of the Internet Boom. I had plenty of skills, but was unsure where or how to apply them. Newspapers remained an option, but a desire to write, to photograph, to fill empty spaces with self-expression that existed long before I ever became a “news executive” was a creative itch that ached to be scratched. His characterization was correct: I was intense, I was angry and, perhaps mostly, I was disillusioned by a profession I loved, but one I also believed had let me down in a way I couldn’t articulate at the time. This cauldron of emotion, made frothier by interviews I’d done with hundreds of working journalists, resulted in The Mood of the Newsroom, the First Draft post that triggered Jay’s encomium. I wrote about the nostalgia for the past and frustration about the future I had found in newsroom after newsroom, a combination that prevented individuals and institutions from embracing the changed needed to keep journalist alive in the digital age. “Professional life,” I wrote, “isn’t turning out quite the way these journalists thought it would – and it makes them mad.” Of course, those words applied to me as well. As it turned out, Mood of the Newsroom was an apogee. It triggered a self-realization that I no longer wanted a traditional journalism career, especially one that favored the past over the future. I continued the blog for another 18 months while I finished the project (and a book with my partner, Michele McClellan), but what followed was mostly denouement. Mentally, I had moved on. About the time I wrote The Mood of the Newsroom, my wife gave me a little digital camera. It was a life-changing gift. I had studied photography in college, first in art classes and then in journalism school. My first post-college job was as a photojournalist on a small newspaper, where once the editors learned I could also write asked me, occasionally at first, but then regularly, to put together packages of photos and feature stories that could fill lots of weekend space. The writing expanded, ambition took hold and I jumped into editing, where I stayed for nearly two decades. Three years ago, a friend started a new magazine where I live, Marin County, just over the Golden Gate Bridge from San Francisco. Would I write for it, she asked. Only if I can take pictures, too, I replied. That’s how it began. I bought a small Nikon DSLR and started shooting – quite badly. My technique was terrible, my vision was unformed and nerves in those first few months made it all worse. Over time, through much trial and much more error, I improved. I learned to control the light, I learned how get the most from a digital file and I learned how to trust my visual instincts. As I grew as a photographer, so did the magazine’s confidence in me. About 18 months ago, just as my friend, Lisa Shanower, the publisher, and I were talking about doing a book she met someone with publishing connections and soon we were mocking up a prototype. The original idea was not a cookbook (and I’ll keep that idea under wraps for now), but we wanted the publisher to think we were serious so our proposal included the outline of a second book, one on organic food. A few weeks later we got the good news from Andrews McMeel, the publisher: Love the book idea – the cookbook! Lisa talked with a local chef, Farina Wong Kingsley, who became my partner in the project, and Andrews McMeel assigned a project manager and designer, Jenny Barry. 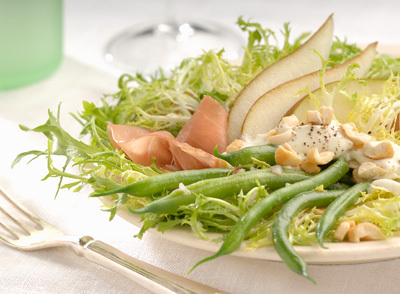 All I had to do was learn to photograph food. If you’ve read this far, I’ll reward you by skipping the details of the photo shoots. I’ll say only that the learning curve was steep and I would not have succeeded as well as I did without the help of numerous others. Indeed, while Organic Marin was a fulfilling project on many levels, the joy of this long-term collaboration with others is what thrilled me most. Even though newspapers require immense amounts of teamwork to produce, they are hierarchical and driven by deadline, daily necessity and a demanding canon of tradition. Collaboration among peers is rare. I have arrived now at a point, somewhat late in life, where people matter more than process, where curiosity and self-expression drive my actions and where, more commercially, I try to build a photography business that blends the best that journalism gave me with, as Jay Rosen might put it, my continuing education about a future still under construction. First Draft by Tim Porter, my blog on quality journalism, is archived here. 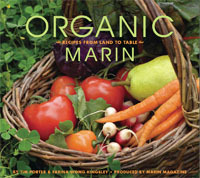 Organic Marin, Recipes from Land to Table: Photographs, stories and recipes from organic farmers of Marin County and the restaurants that support them. Buy it here from Amazon.